You may have seen my post about my Chromium Embedded Framework powered UI engine. But it's made so many strides recently that I've decided it needs a new thread. First off, it's completely redone! Do you use BLUI in your project? I'd really love it if you credit me and it! You can even use the logo right here! As you can see, we're using plain old HTML loaded from disk, rendered to a texture, then painted on an image widget using a UMG brush! 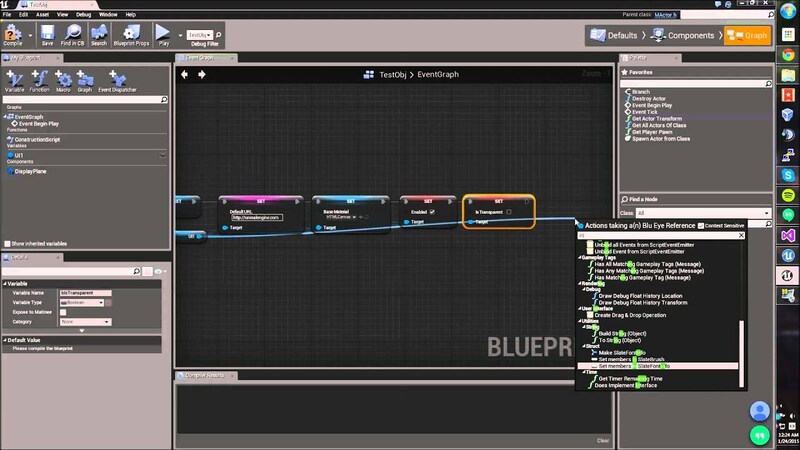 I'm trying to make the blueprint system as simple as possible, there aren't any dependencies on specific display methods, allowing you to instantiate a "BluEye" within ANY blueprint, set the options using blueprints, then grab the material instance using a node that you can paint on ANYTHING you like. There are also helper nodes and functions to pass mouse input, and keyboard input into the "browser." Once again. It's free, MIT licensed, and is powered by CEF. Here's a quick technical run down on how it works! This process is like the Chrome browser, it will take care of loading the page, js, css etc. There is minimal impact on performance as all the HTML page loading happens in another process. The texture also only updates when Chromium requests a redraw, it does not redraw every tick! This is open source! If you find bugs, hit me up or file an issue on the Github page! Better yet, fix it yourself if you're up to the challenge and make a pull request! Please make pull requests, leave feedback, and let me know what you think! I hope this makes your lives easier while developing with the awesome UE engine! 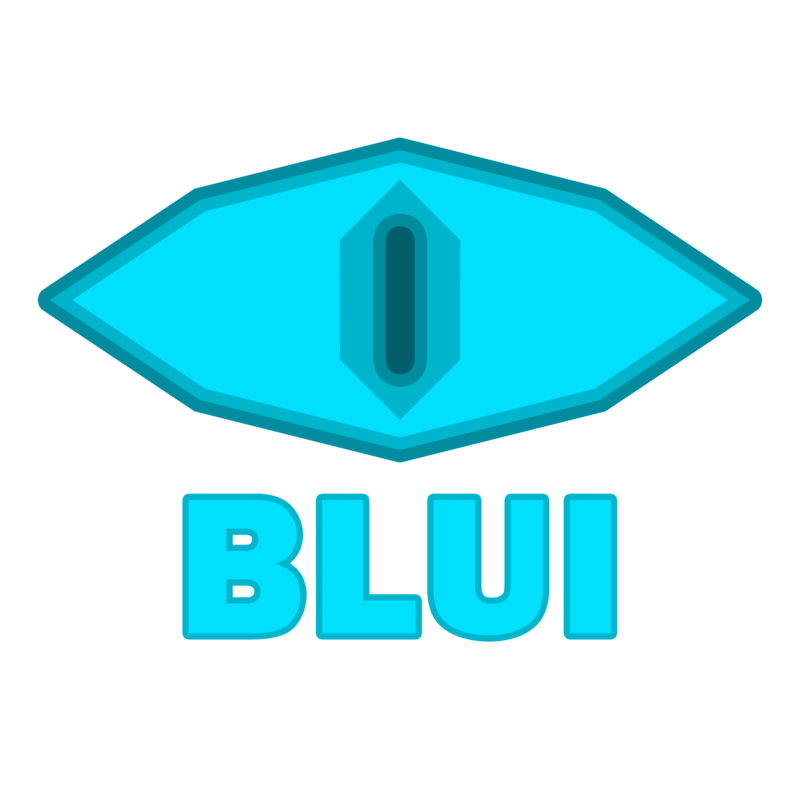 BLUI got featured on the community spotlight! BLUI Got a Dev Grant! Check out the batch of grants here! Last edited by AaronShea; 11-13-2015, 02:06 PM. Aaron looking sweet. Seems just like radiantsdk.com which is good cause I can't make that work and my game really needs something like this...development is so much more important but will there be an how to videos any time soon to walk us through it. I will be creating a video! Hopefully tomorrow! Should give some more information on how to get going! Last edited by AaronShea; 02-06-2015, 12:49 PM. Copy all contents of shipping into your packaged game's GameName/Binaries/Win64, these are the required files for the Chromium process. Can I add a "web browser" which opens youtube in game for example? How are keyboard/mouse inputs handled? Last edited by BrUnO XaVIeR; 02-09-2015, 05:07 PM. The CEF Build used with BLUI is only Windows 64 bit, with some work you could replace these libraries with the 32 bit version from the CEF Builds site. I mean, how to handle input on a plane like I were navigating in Chrome, not HUD controls. Show mouse cursor on the plane, make it receive keyboard input, etc. I've tested it and looks pretty great and simple install. The simpler one I've seen so far; But it's early in development, right. There's no way to shutdown a instance, it is still running until I close UE4 Editor. Even when I stop playing the game it is still running. I mean, if I set it to disabled, rendering will stop; But try doing that on a page of a video online. The video is still running on the background even if the rendering of the plane in-game has stopped. Also, the rendering is always on square texture?! Last edited by BrUnO XaVIeR; 02-10-2015, 02:10 PM. Hello again, BLUI tries to not be in the way at all and only provide the functions necessary to create your own custom solutions. It does not assume anything about the project. That being said, BluEye instances shut down their browsers when they are destroyed by the engine. The processes you see (should be about two) while the editor is idle are simply something CEF3 must do. They also provide the remote page inspection tools page on port 7777. But if you want to close the browser by force I'll be adding a method for this in the next 1.2 release. For keyboard input, I would recommend overriding the viewport class in C++ and intercepting the key input events from there. For mouse input, without a UMG widget in 3D space you need to take care of calculating mouse input yourself. On a plane, it won't be to hard, just fire a trace and figure out where it hits, translate that to X,Y coords and run the mouse click method. It is very early in development, so please keep this in mind, hope this answered your questions. Thank you for the reply. the thing with 'square texture' is, I'm trying to have the page rendering on a 19:6 quad but the output image is always a "browser window" of around 512x512 with scrollbars on it. I guess is the default "window size" ?! If you could point to me where in the source I can change that to go on and keep experimenting with the plugin would be great. I've added a blueprint to destroy the "tab" process because I want it to stop running when Player leaves by overlapping a trigger box. Last edited by BrUnO XaVIeR; 02-10-2015, 03:52 PM. Can't seem to get it work that I am seeing a gray ui. Could make project file. Using the plugin. I did that and nothing happen. 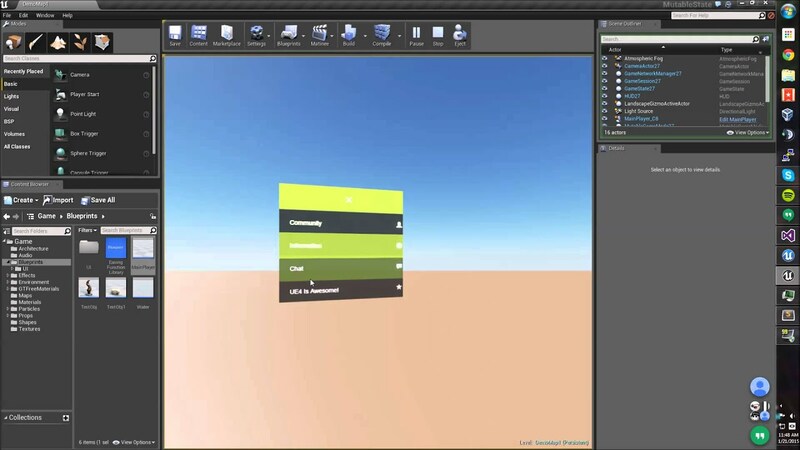 I am using the UE 4.6.1 version. Never mind there was just a bug for some reason it didn't run right. Had to make a new project. Last edited by Lightnet; 02-11-2015, 07:47 PM.